The basement in its somewhat original condition (after the drywall from the previous owners was removed). One lesson I learned fast when I bought a house is that a homeowner’s number-one enemy is not the mortgage—it’s the water. That vaguely brown spot on the pantry ceiling? Water leaking in between the two-story side wall and the one-story extension, where 90-year-old tin flashing had completely corroded. The rotted windowsills? Water overflowing the clogged and poorly pitched gutters, then cascading onto the windows below (apparently for decades). And the basement’s musty smell and chalky walls? That was water too. And it was everywhere: seeping in through leaky old windows, dripping down the walls from where the foundation met the sill, and creeping in from below where the foundation walls met the floor. The original 2x4s and tiles glued directly to the concrete floor also needed to be removed. We tackled the roof and the windows, which were straightforward (if expensive) solutions. 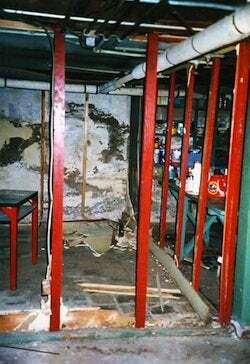 The basement was another story; we tried almost everything but nothing seemed to do the trick. We replaced the old wooden windows with vinyl sliders (and tightly caulked those new ones). We regraded the soil outside to encourage water to run away from the house. 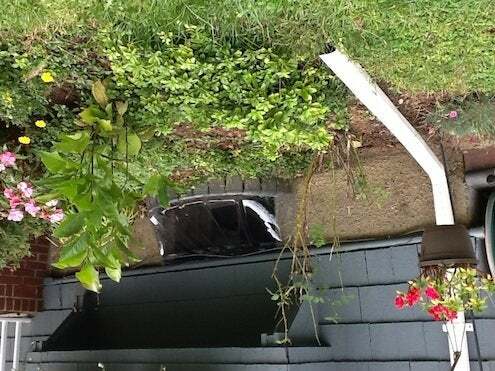 We extended the gutter downspouts to get rainwater far away from the foundation. We used special foundation cement patch to fill any visible cracks. We were almost there. A French drain, we learned from an estimate, would be really expensive, and it wouldn’t actually keep the water out (only drain it away once water got inside). A much less expensive decision actually made the single biggest difference: We bought $5 plastic window well covers. That eliminated most of the remaining problem, all for an investment of $25. We’d winterized the sun porch a few years back, making it a usable year-round play room, but it’s only 200 square feet and had become so cluttered with toys and games that there was almost no space left for the kids. (Besides, I wanted it back as a sun room!) Those extra 800 square feet in the basement were awfully attractive, but not if everything we put down there had to be raised up on stilts. The best investment we made: $5 plastic window wells. The water problem seemed isolated to just the front wall, and not even the whole wall, just the half to the east of the front entryway above. No matter what we did, that twelve-by-seven foot portion of the wall would not stop seeping. A formidable crack ran diagonally from the window down nearly to the floor. Once caulking the window and filling the crack failed to solve the problem, we finally accepted that the solution lay outside. We had to protect that exterior and prevent water from penetrating the foundation in that compromised area. Oh, we knew the answer—dig up the front yard and cover that wall with a watertight membrane. But we didn’t rush into the project. The expense of it, the mess of it, the damage to the garden… not to mention finding a contractor. We avoided it as long as we could. Then last year, as we were remodeling our kitchen and needed a new foundation poured under the extension, the planets aligned. We had the cement guy right there, he had all the equipment he needed, and even the expense suddenly didn’t loom as large. Hey, on a project that size, what’s another $1,000? For six months we watched and waited, checking after every heavy rain. Could it be true? Yes! We were pretty much dry (although after a torrential downpour there was still very minor seepage along the seam where the walls meet the floor). 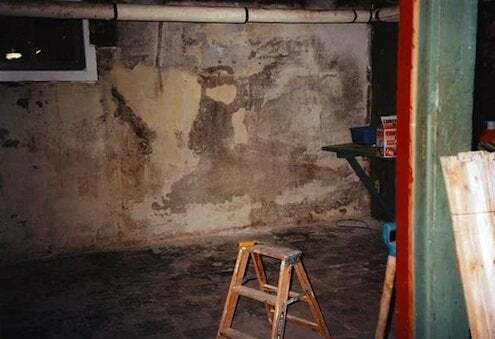 We called in the painters to scrub off decades’ worth of efflorescence and apply two coats of waterproofing paint, and suddenly found ourselves the proud owners of a clean, (pretty much) dry basement. 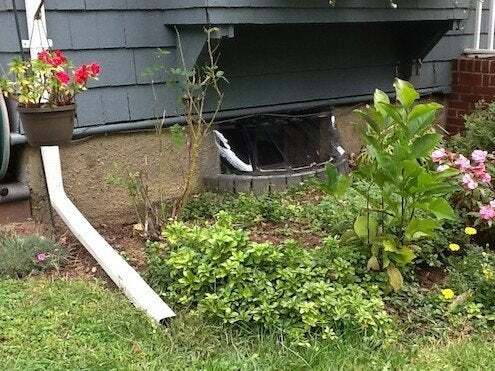 Soon, we’ll replace all those plastic window well covers soon. They’ve gotten a little beaten up over the years but are still the best $5 investment we’ve ever made. As insurance goes, they’re well worth the price.